Total Reading Time: 8 minutes. Face palm. Sound familiar? What if there was a way to know exactly how much money you had available in each category of your life? What if you could have your finances completely automated? Ah, well there is a way, friendo. Use the strategies and tools in this post to do just that. Get rid of most (if not all) of your worries about money, and know exactly where you stand financially. It’ll also become a lot easier to say yes or no to Belize trips (and there’s nothing wrong with saying no — here’s how to do that the nice way). Real freedom is the ability to do what you want, when you want, how you want. — Tweet this! Understanding how the rich think about money is a great start, but it’s only part of the puzzle. The other piece is having your finances on lock down and being able to make decisions confidently. This is about shifting from a reactive mode to a proactive one. This will result in much less time spent on finances and feeling way more in control. I’ve been using the strategies in this guide successfully for almost ten years. The key is to take action and implement each step right now. Personal finances are also an important part of becoming a full-time solopreneur. Knowing when to make the change and having your finances in order is key. A common roadblock to becoming a solopreneur is the fear of not having enough money. Handling this is critical to your long-term success. After all, you want freedom, but who wants to live like a college student again and eat Cup Noodles again? This is pretty much Step 0. It is important that you get organized and immediately begin tracking a high-level view of your finances. The fastest and easiest way to do this is with a Mint.com account. I don’t see any reason to use another service, as this one is already a proven, popular solution and has all the features you’ll need. Let’s not complicate this, it’s about getting started. Mint gives you the detailed, transactional level information you need. You’ll also get a high level overview of your finances, i.e., you’ll see your cash flow and balances across all accounts. This service is customizable and comes with a ton of features to take your finance game to the next level. Once you’re set up and comfortable with the interface, I’d recommend setting up a few budgets and goals to make the most of it. If you’re still hanging out at a brick-and-mortar bank, you must have been around when people took a horse and carriage to Wells Fargo. If that’s you, I’ll make this as painless as possible. Instead of asking you to switch and let go of your beloved bank and favorite teller, I kindly suggest that you open a free account with the online bank I mention below. Once you start using them, I virtually (hehe) guarantee you’ll go all in and will forget all about J.P. Morgan and the others in the ol’ boys club. Formerly known as ING Direct, Capital One 360 is the foundation and secret to automating your personal finances. It’s free, there are no fees for anything (in fact, you even earn interest on your checking), no minimums, and it’s simple to use. You can also have up to 25 free savings accounts, but it’s the Automated Savings Plan feature that makes this all so appealing. This is modern banking at its finest, which means there are no physical banks for you to visit — everything happens online. Don’t panic, just give it a shot and you’ll see. This is the key to automation, and is a necessary piece of this system — click here to sign up for a free account now and you’ll also get $50 through my link. First of all, let’s correct one important piece: I want you to never pay another ATM fee again. I know, “that’s easier said that done”. But that’s why you have me in your life. Here’s everything you need to know on how to do that: Get Rid of ATM Fees Once and For All. Now, the next step is to set up your Automated Savings Plan. As we both know, it’s difficult to budget your money and try to save some cash. By the end of the month, little remains. That’s why it’s important to do this automatically, before the money ever goes into your pocket. It also prevents you from feeling a sense of loss, since you never had the money anyway. With Capital One 360, you’ll want to create a handful of free savings accounts that match up to your different lifestyle needs — get creative with this. 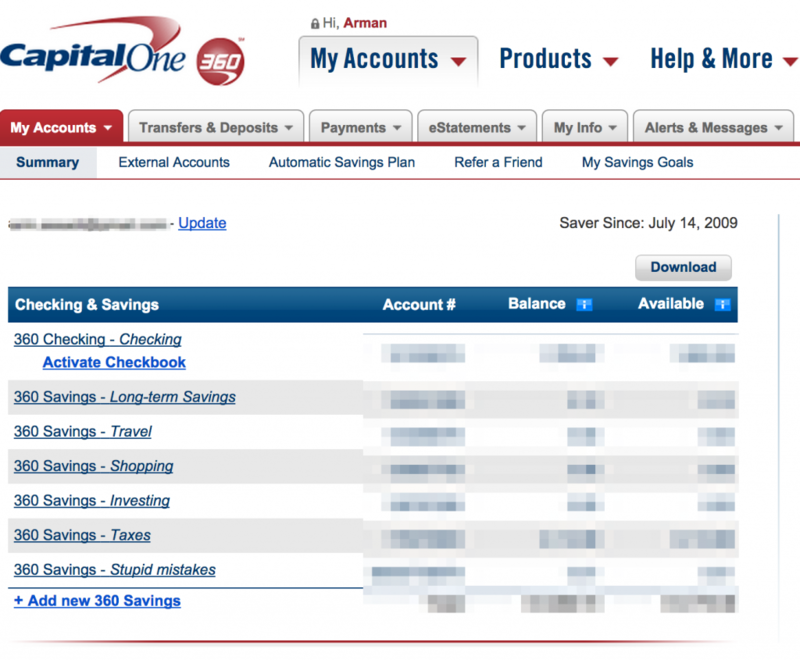 Screenshot of my personal 360 savings accounts – get creative! You can change these whenever as needed, and can add up to 25 different accounts. Gifts – I love this for budgeting in birthday and holiday presents. Real Estate – Save for your first home or an investment property. Short-term savings – You never know! Going out (fancy dinners, drinks, etc.) – I love this, no guilt for spending frivolously on indulging. The idea here is to use the Automated Savings Plan and begin building up the balance in each of these accounts. For example, on the 1st of each month $50 gets transferred from your checking to your Shopping account. $100 gets transferred to your Long-term Savings account, and so on. Now, when your friend asks if you want to go to Belize, you look at your Travel fund and decide whether you can afford it (and see how big you can go). You’ll also know what your exact budget is for the trip, and you’ll never need to spend a dime for your checking account — boom! It’s a beautiful thing, right? If you’re still paying your bills by sending in checks with cute little envelopes and holiday-themed stamps, there’s no hope for you. But if you’re ready to automate the process and have some idea of how to do this online, I may be able to help. Call every company you pay a bill to each month (or have your personal Fancy Hands assistant do it) and make sure all your payments are due around the same time each month. This is doable with most companies, but some old school ones may be a little less flexible. Arman’s tip: Adjust the due date to right after you are usually paid or paying yourself. Sign up for paperless billing. You don’t need the papers. There’s nothing fun about getting bills in the mail, and it’s better for the environment. If you ever need a copy of an old bill it’s available online. Sign up for automated payments. Make sure all your bills get paid automatically, without you ever thinking about it. Whatever excuse you have for wanting to pay your bills yourself, lose it. You will save hours per month and feel a massive sense of relief. Go focus on making more money, not managing it. Check your transaction history once a month through Mint.com. You don’t need to check your finances more than this, and it should only take 30 minutes. Every once in a while there may be a fraudulent charge or something that looks funny, and this should take care of that. I shouldn’t even have to say this, but: never carry a balance on your credit cards, pay off your debts in full each month, and try not to owe anything to anyone. If you’re in any kind of debt, make it your number one priority to pay it all off as soon as possible. Sacrifice and do whatever it takes, this is so important. A long-term savings plan is crucial, although not nearly as important as creating wealth (see below). There will be times when you need to be ready for a financial drought, especially if you work for yourself or plan to at any point. Make sure you are using the Automated Savings Plan feature and put as much as possible into that account at the beginning of each month. Have a goal to hit a certain number by a certain time, e.g. $50,000 within X months. Once you hit that number, begin taking any excess and invest in assets. Choose things like real estate, stocks, gold/silver, or any asset class you have interest in. You should also be doing this with your Investment savings account. As I explain in this post, money (cash) does not equal wealth. This is a misconception and lie that our environment has instilled in us over many generations. The rich are not on a hunt to accumulate as much cash as possible, they measure their wealth through their net worth. The idea is not to get cash, but to accumulate assets that trickle off cash over time. You want to achieve a point of living off the interest of your assets. Allow the principle to stay put, or rollover into other investment vehicles. Become interested in one specific asset class at first, (e.g. real estate) and achieve a level of mastery in your knowledge. From there, you should also remember to diversify how you allocate your investments. Don’t try to do this alone, especially if it isn’t something you’re already passionate about. The same way you need a consultant to help grow your business, you need a wealth advisor to help grow your investments. 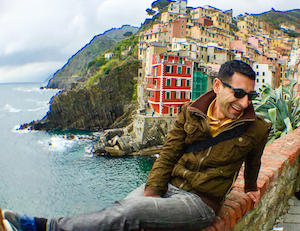 5 Odd Lessons Learned From Long-Term Travel. #2 Was Hard to Swallow.